It was very windy during the night and I was glad that I was tucked behind a big hedge. It was a fairly dull start to the day but that didn’t last long and soon the sun was bright, the sky was blue and it was another scorcher. Unfortunately the wind died down so that made it feel hotter. 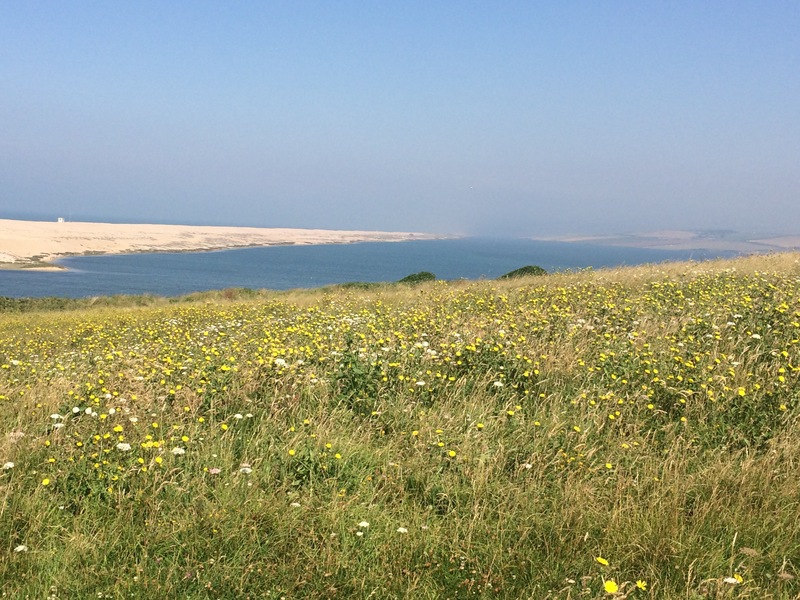 It was lovely walking through the Fleet Lagoon Nature Reserve, with great views of Chesil Bank. I was struck by the large numbers of butterflies, of several species; more than I had noticed elsewhere. 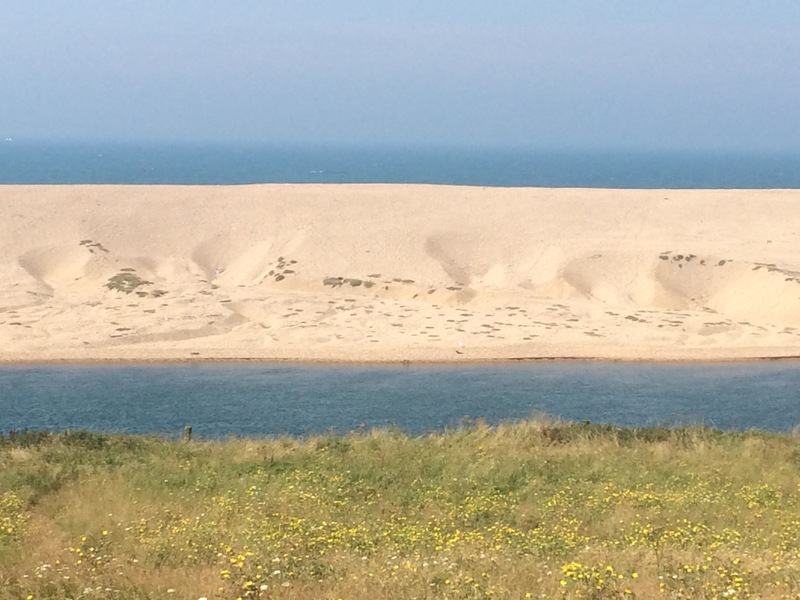 Chesil Beach is one of the finest storm beaches in the world; formed over 6000 years ago by rising sea levels. It is 18 miles long, rises up to 15m high in places, and is made up of 100 million tonnes of pebbles. It is amazing to walk alongside (it would be energy-sapping to walk along it) and to see how it changes. The pebbles grow in size from pea-sized in the West to potato-sized in the East. Apparently, on a foggy day, local fishermen (and smugglers) can tell whereabouts they are on Chesil Beach just by the size of the stones. 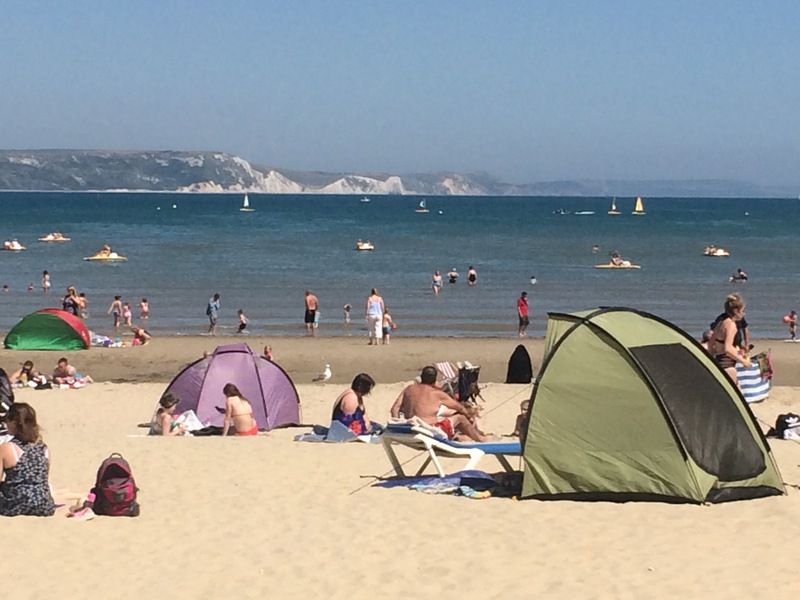 I walked past a couple of Army camps on the edge of Weymouth and found out later that the town had been the main base for Anzac troops convalescing during WW1. 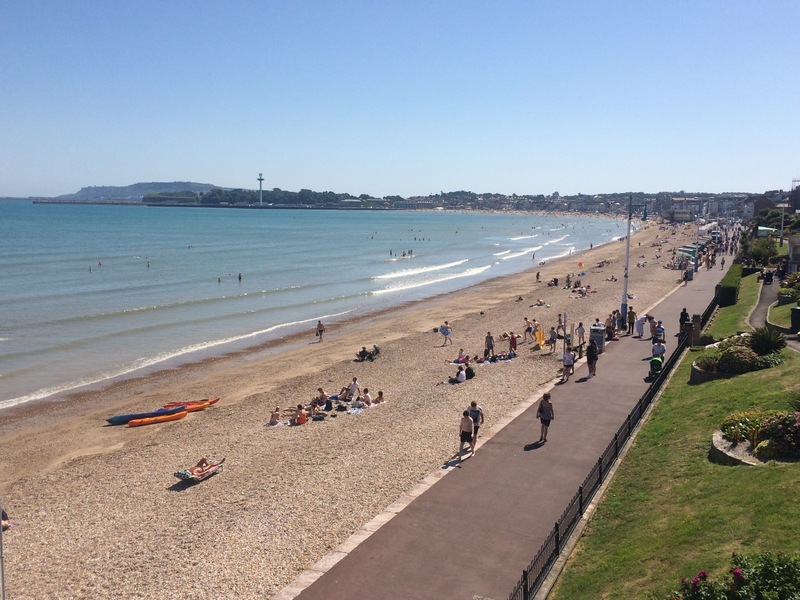 After an exposed walk in the heat, with no refreshment stops, I made it to Wyke Regis and Ferrybridge, the tip of Weymouth. I was hungry. 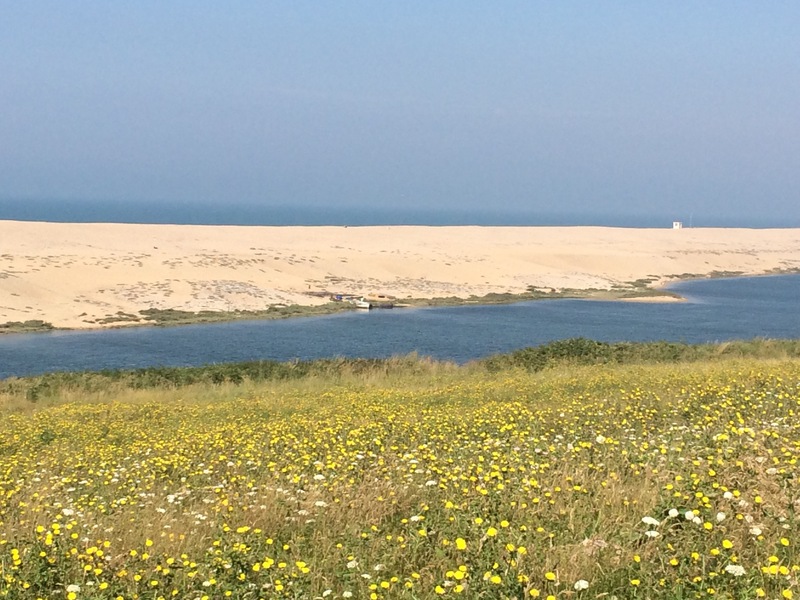 I crossed the road heading across the tombolo to the Isle of Portland, that would be tomorrow’s walk. 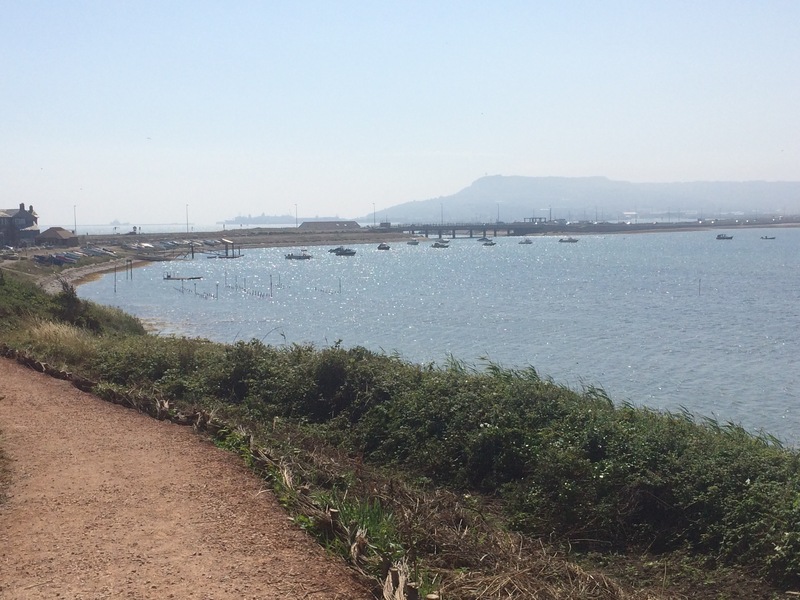 Instead I turned North East and walked along the edge of Portland Harbour towards Weymouth sea front. 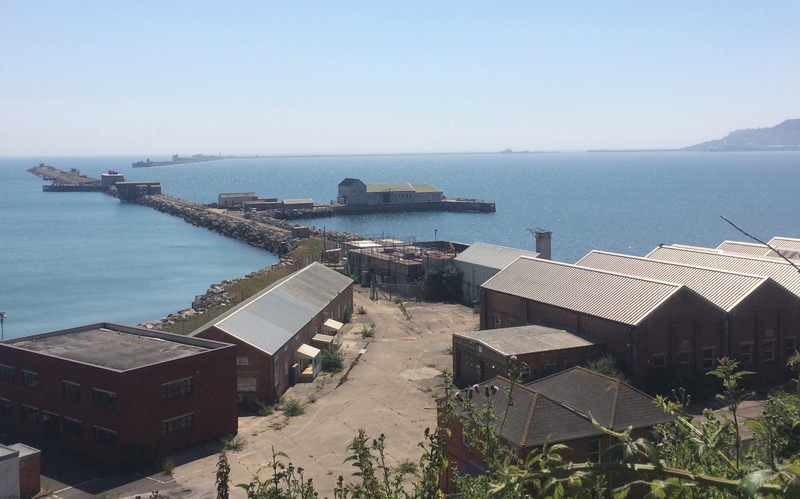 Right at the tip was a housing estate built on the site of the demolished Whitehead’s Torpedo Factory. 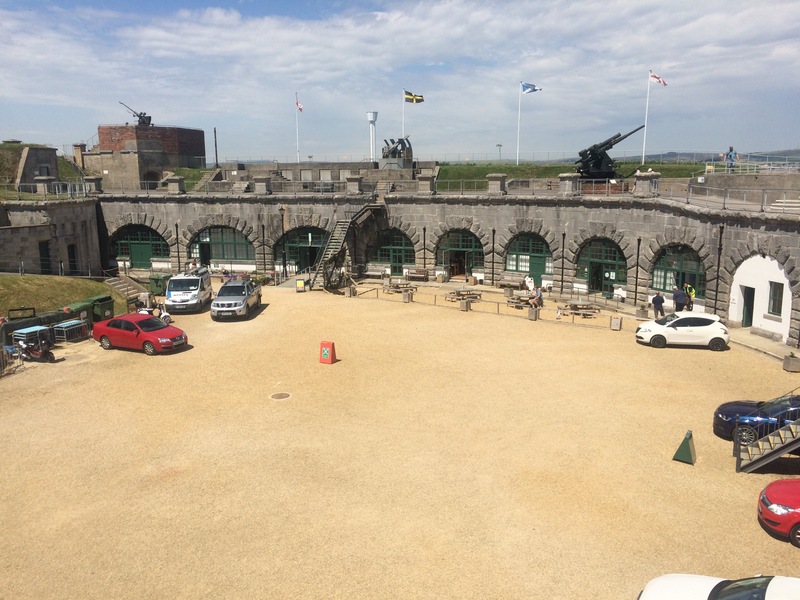 Torpedoes were built here, and tested in the harbour, between 1891 and 1969. 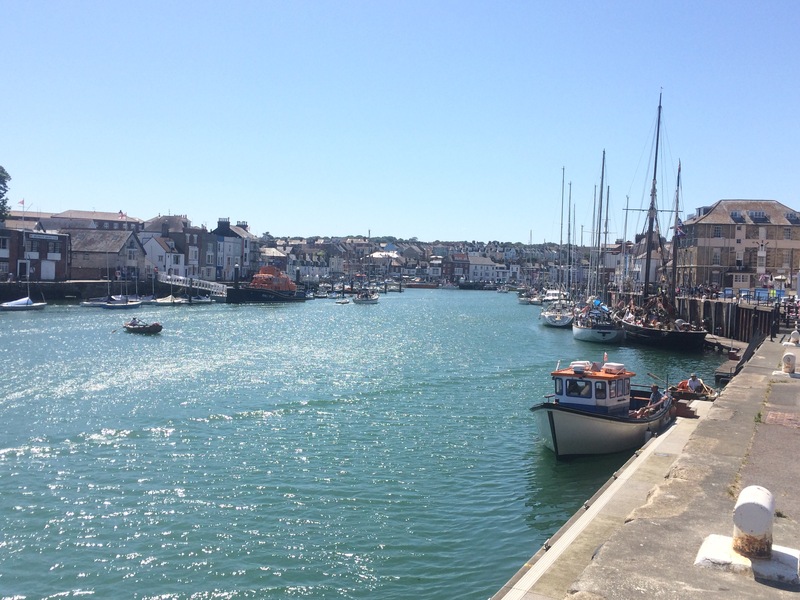 I thought the harbour looked impressive. I stopped for an ice cream at Sandsfoot Castle, built under the orders of King Henry VIII to protect shipping in the ‘Portland Roads’. 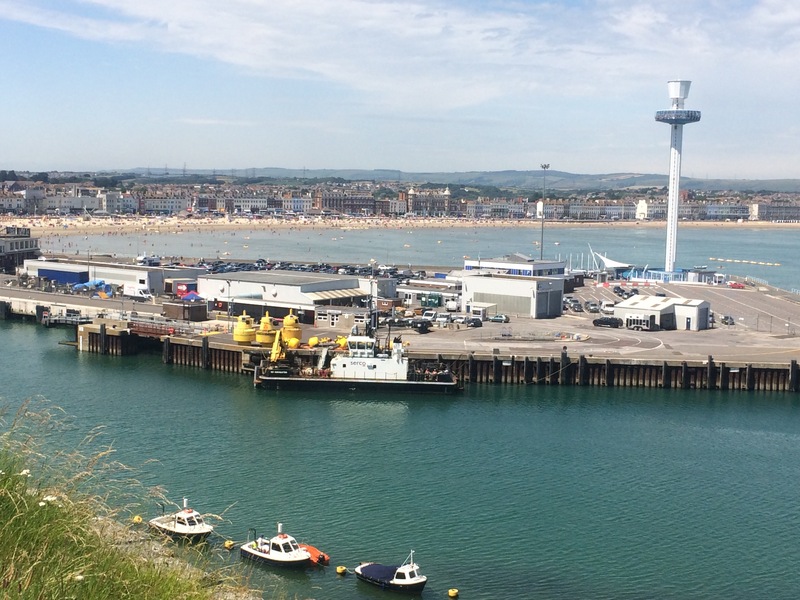 Thus confirming that Portland Harbour has been important for a long time. I was still hungry. 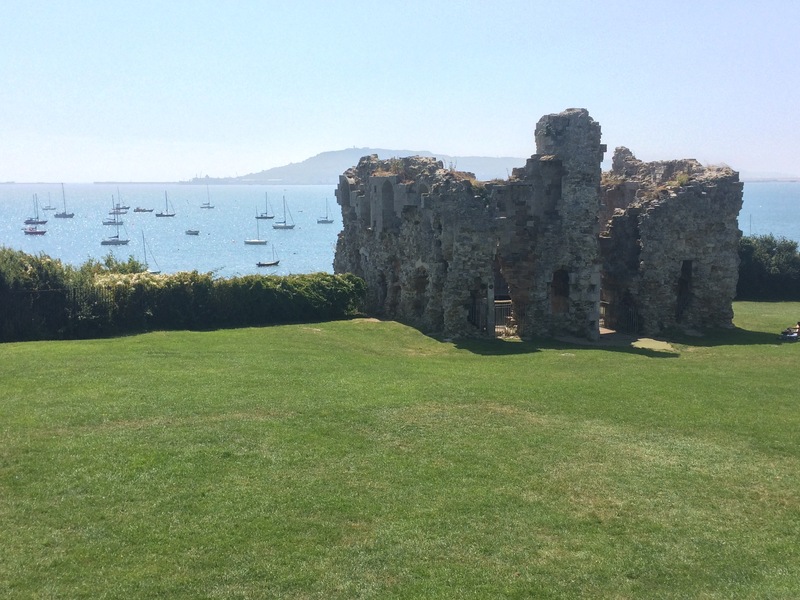 I saw a sign for a cafe at Nothe Castle (rhymes with clothe) and made a beeline. After some refreshment I took the opportunity to look around the fort and I’m glad I did. It had some excellent displays and was a great little museum. Being a fort, it was of course well placed to afford some of the best views. 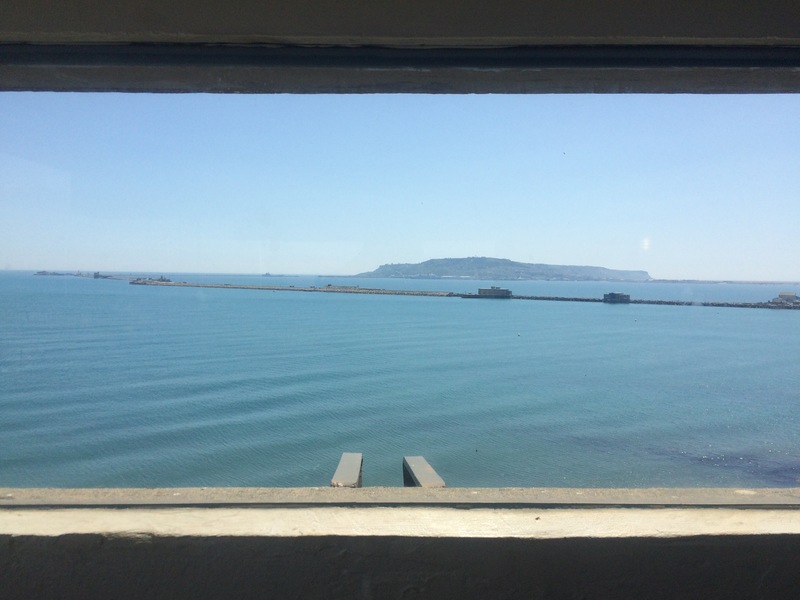 How lucky that the sky had turned so blue to make the views all the way from the Isle of Portland to the Isle of Purbeck even more spectacular. I stayed for a while to enjoy them. I like to catch a ferry and there was a rowing boat ferry across the River Wey from Nothe Fort Gardens to the old harbour. 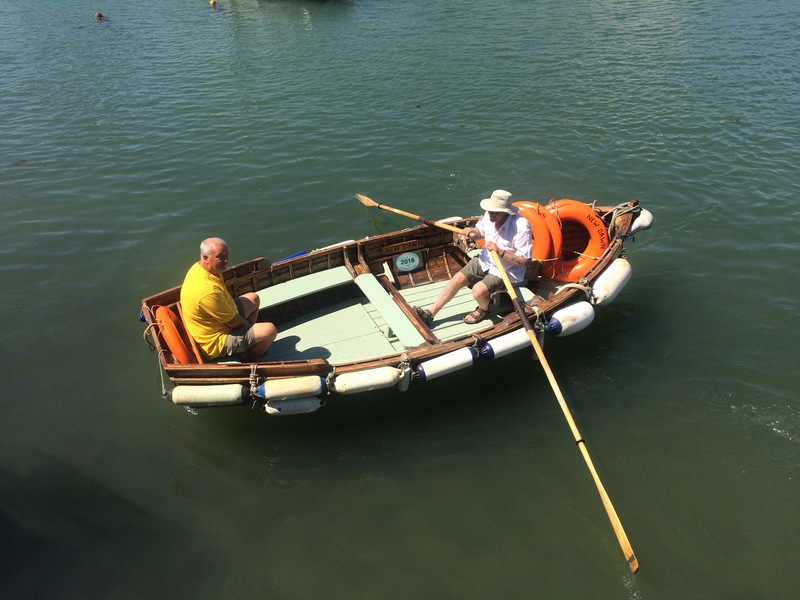 I hadn’t been ferried by a rowing boat since Suffolk! This one cost me £1. 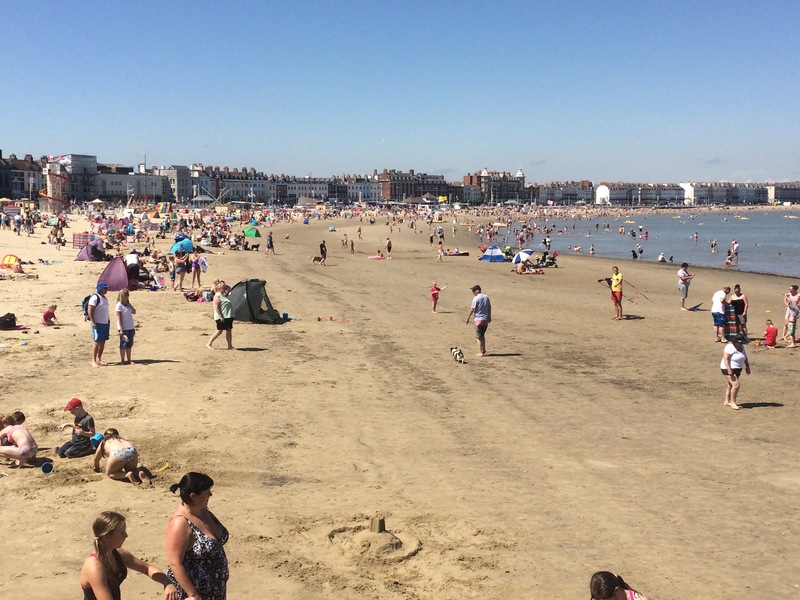 The summer holidays had started; Weymouth Beach was packed. There were people everywhere, many burning in the hot sun. The green sea looked cooling but I couldn’t face the crowds so I carried on walking along the promenade, dodging the tourists. I was intrigued to see the Royal Navy holding a beach rugby tournament; a good way to draw in spectators. 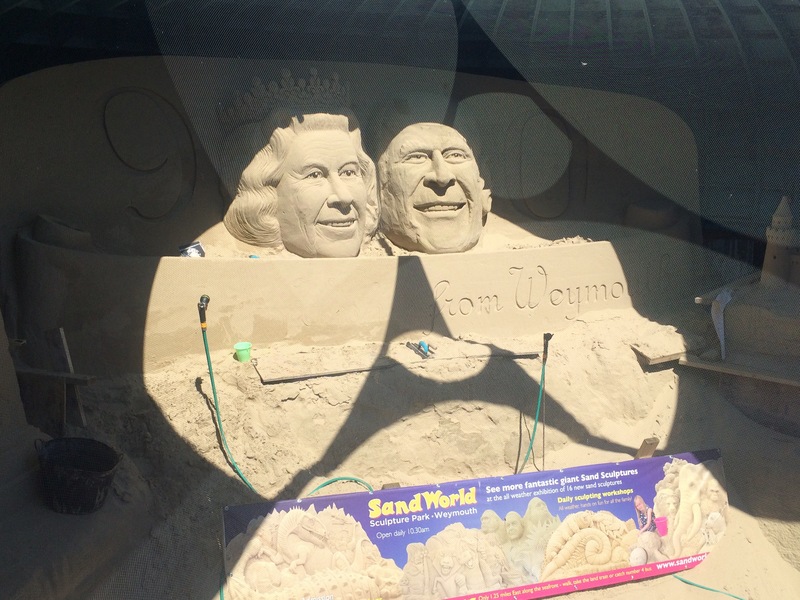 Weymouth is known for its sand sculptures – apparently it’s the right kind of sand! 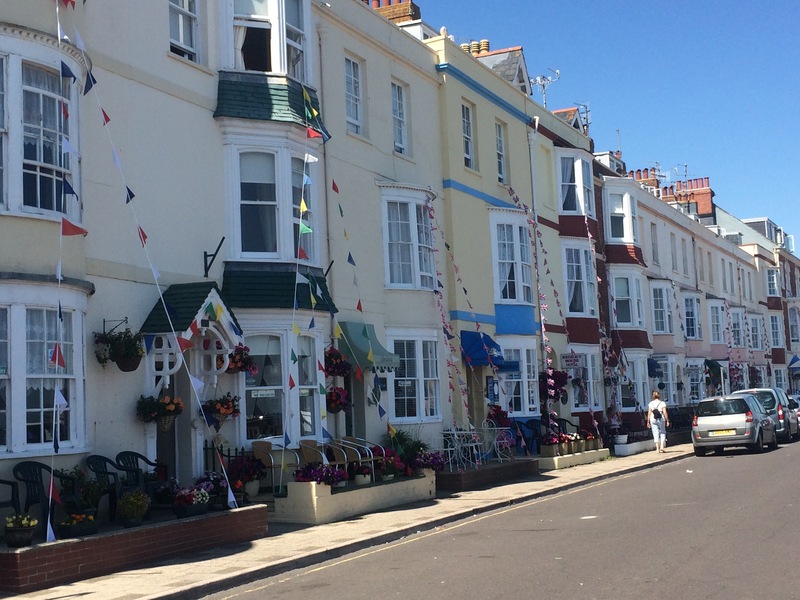 King George III spent 14 summers in Weymouth, helping to establish it as a holiday destination from the late 18th Century. The town’s affection for the King was evident. 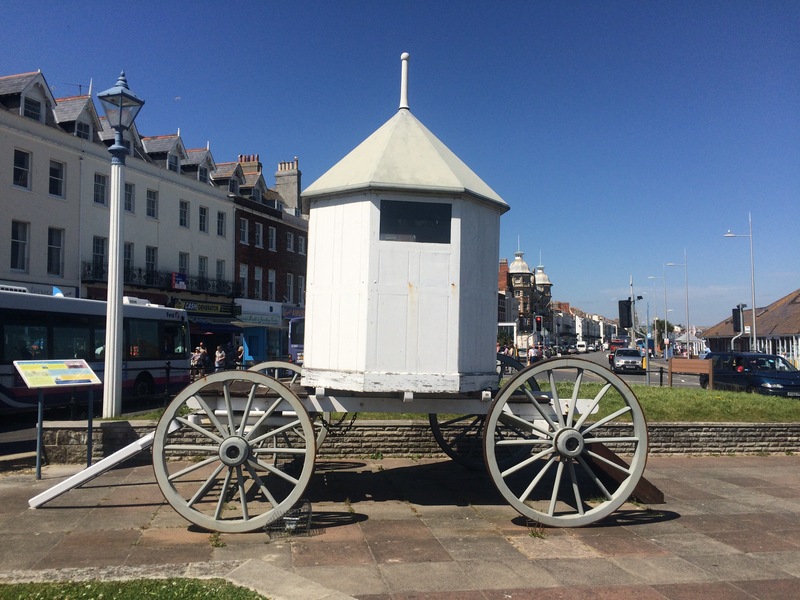 I admired his bathing machine sat in the middle of a roundabout. 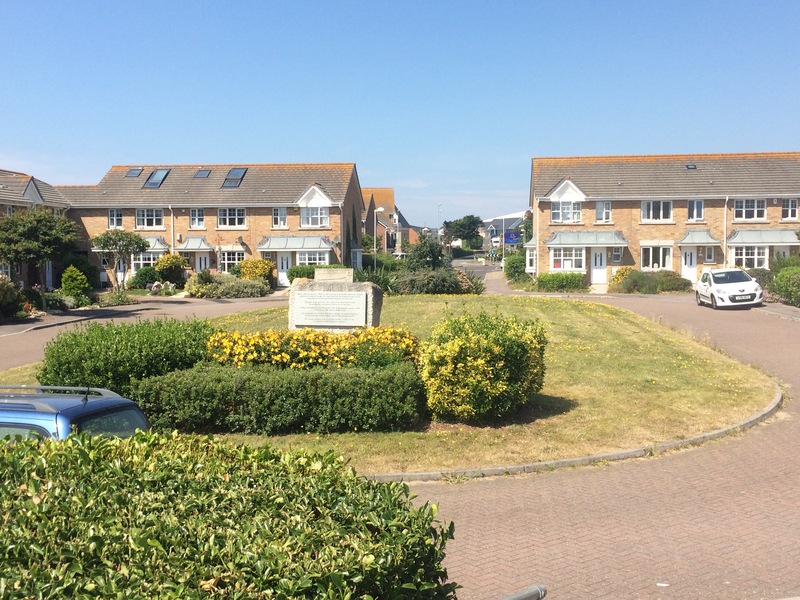 I had arranged to meet up with my next-door-neighbour, Grace, as she often works in Weymouth. 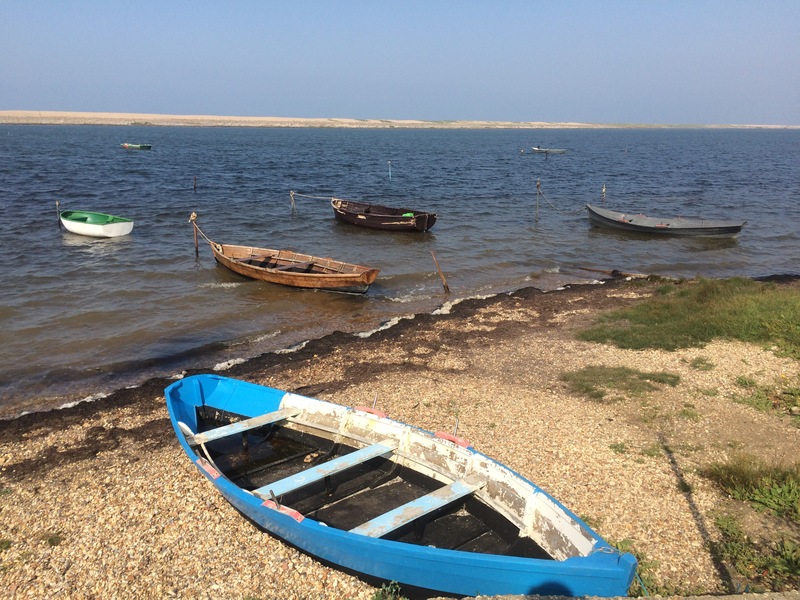 So, once I reached Lodmoor Country Park, I turned around and walked back along the promenade to the harbour and the Ship Inn. After a lovely catch-up with Grace (and the chance to rid myself of a few old maps) I was collected by Geoff and driven to his house in Dorchester. It was great to see Geoff and Kath, enjoy a BBQ, do my laundry and sleep in a bed. A ferry boat in Suffolk must seem like 3000 miles ago……..oh wait a minute it was 3000 miles ago!!!!!! On on Juice not far now till Tower Bridge.